The perfect gift for any Nurse or Doctor. Give that special Nurse or Doctor a gift they will remember with this colorful charm set of Earrings. 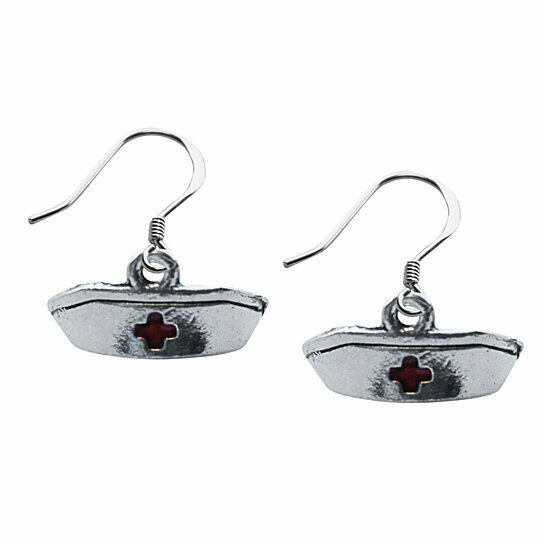 Whether you prefer silver, this Nurse or Doctor hat charm set of Earrings will coordinate with your favorite Whimsical Watches, Whimsical Bracelets or Whimsical Necklaces. Whimsical Earrings are sterling silver plated french wire and come with rubber backs. Discover the Whimsical Gifts Collection to include Whimsical Watches, Whimsical Bracelets, Whimsical Necklaces, Whimsical Ear Rings and Whimsical Dangles. The expansive selection of high quality whimsical fashion jewelry offers cute, unique, hand crafted and painted miniature charms all designed, made and distributed in the USA. Whimsical Gifts Collections features an array of themes from animals, hobbies, holidays, special interests, seasons, professions and more. All Whimsical Gifts are all carefully made to add a personal special gift feel and receive a quality inspection to ensure they meet Whimsical Gifts high standards. All Whimsical Gifts jewelry are RoHS certified and meet worldwide jewelry standards. All Whimsical Gifts pieces come packaged in a gift box, making them ready to give wonderful gifts. In addition, we offer both USPS or UPS shipping anywhere within the continental U.S. International shipping options are available as well. Whimsical Gifts stands behind their products by offering a one year limited manufacturers warranty on all parts and labor. Any piece will be repaired or replaced within that one year period for free. All Whimsical Gifts are all carefully made to add a personal special gift feel and receive a quality inspection to ensure they meet Whimsical Gifts high standards. Whimsical Gifts Collections features an array of themes from animals, hobbies, holidays, special interests, seasons, professions and more. All Whimsical Gifts pieces come packaged in a gift box, making them ready to give wonderful gifts. All Whimsical Gifts jewelry are RoHS certified and meet worldwide jewelry standards.